A key aspect of the programme is that the lay people in their gratefulness are coming together to celebrate and reflect on the life of St. Joseph Vaz. The goal of bringing together the faithful is to create an awareness of true discipleship among people. The St. Joseph Vaz National Day Programme will unfold at the National Shrine of St. Anthony, Wahakotte. The programme will commence at 11.00am with the inauguration of an exhibition on the life and mission of St. Joseph Vaz and the work of the Lay Apostolates. At 5.00pm there will be a special presentation on the life and mission of St. Joseph Vaz by His Lordship Most Rev. Dr. Vianney Fernando (Bishop of Kandy and the Chairman of St. Joseph Vaz National Secretariat). The highlight of the programme will be a Night Vigil of Prayer commencing at 8.00pm and ending with the Celebration of Holy Mass at 4.00am. Though St. Joseph Vaz (1651-1711), Apostle of Sri Lanka was born in Bernaulim, Goa, India, he dedicated his whole life to the resurgence of the Catholic faith in Sri Lanka when he heard of the sufferings of the Catholics under the Dutch. In 1687, braving grave obstacles and a storm at sea, he made his way from Tuticorin, India to Sri Lanka. He and his companion John were off loaded at Mannar, and with much difficulty made their way to Jaffna where his mission began. He encountered not a clerical Church, but a Church of the laity in Sri Lanka when he arrived. The beauty of his mission was that in the absence of Catholic priests he ministered by empowering the lay faithful. He did this by building a lay leadership structure, to collaborate with him in resuscitating the Church. He raised and appointed lay leadership which continued to lead and care for the local flock during his absence in between his visits, encouraging faithfulness. This also resulted in the raising up of mature and committed disciples among the faithful. He displayed heroic sanctity when he ministered the people of Kandy plagued with the small pox epidemic. His deep faith in God and intercessory power was publicly manifested when the long period of drought in Kandy ended with torrential rainfall everywhere except over the area where he was praying. 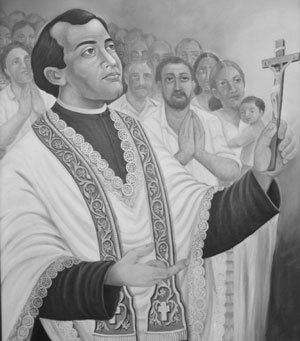 St. Joseph Vaz was a pioneer of inculturation. He learnt the local customs and practices, mastered the Sinhala and Tamil languages and thus was able to strengthen and minister to people in the midst of intense persecution. His missionary work was marked by great suffering, rejection, self sacrifice, obedience, fasting, avoidance of comforts, charity and a personal choice to live frugally. In his utter humility, he even rejected praise, acclaim and high leadership positions including that of a Bishop. In lighter vein, he was a master of disguises switching between acting as a coolie to a washerman, to being a bangle seller, in the best interest of saving souls. The Catholic Bishops’ Conference of Sri Lanka has declared this year as the Year of St. Joseph Vaz and the climax of the celebrations will be the St. Joseph Vaz National Day together with the Prayer Night Vigil that will pave the way for us to become a truly participatory and an evangelizing church in Sri Lanka. Various Catholic Lay Apostolate Movements such as St. Vincent de Paul Society, the Legion of Mary, Cursillo, Kithudana Pubuduwa, the Community of the Risen Lord and other lay apostolates under the umbrella of the Catholic National Commission for Laity have come together to organize this program. It is envisaged that this programme will stir the faith of the lay people and foster unity among the Church’s various Lay Apostolates, providing a common platform for them to come together in prayer and celebration.